Recently, I felt the need to read up a bit on the history of caricature. I am studying its origins and the works of some great artists who gave this art form a dignity of its own. I will share with you what I find out in a series of posts about this subject. 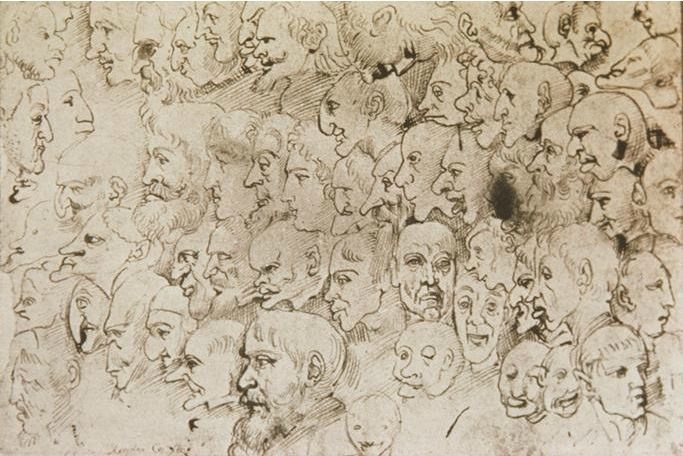 Even Leonardo da Vinci sketches of grotesque human faces that are often referred to as early forms of caricatures are actually more of an in depth study of the human physiognomy and the grotesque of it than the expressions of an art form. 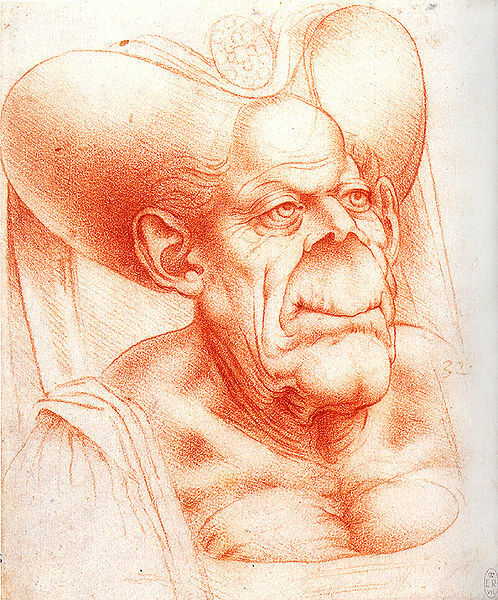 "Grotesque Head" by Leonardo da Vinci,second half of XV c.
Imagine my excitement when I found out that modern portrait-caricature have originated in Italy around the 16th Century particularly in Bologna, where I am based now. Yes, caricature was born at the close of the 16th century in the Carracci Academy in Bologna (1585), the art school founded by the brothers Annibale and Agostino Carracci. They used to draw their "ritrattini carichi” (small loaded portraits) during breaks from work, as an exercise and a recreational activity. They had the ability to catch in a flash and with a sketch a face, a character of a client walking in their workshop or of ordinary men and women hanging out in the countless taverns of Bologna. At the time of Carracci, artists no longer felt the need to imitate nature, but instead aimed at grasping the essence of reality lying behind appearances in opposition and as a challenge to Mannerist artistic practices of that time. Examples of Annibale Carracci’s “ritrattini carichi” are just below. Here's mine to you dear Annibale. Thank you for what you have done! To be continued...stay tuned for the next amazing chapter on the history of caricature!